The wheel-driven land speed record differs from the absolute land speed record in requiring that the vehicle be wheel-driven; thus, jet engine and rocket propelled vehicles are ineligible. 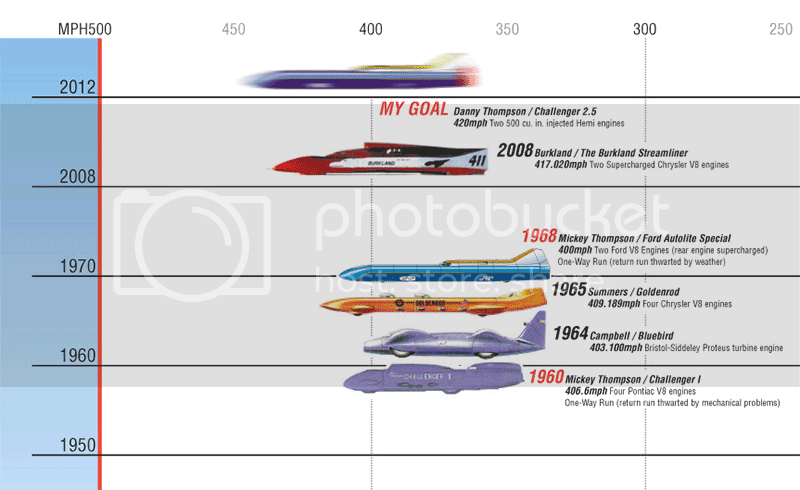 Until 1963, the absolute land speed record holder was always a wheel-driven car. The first jet-car to exceed the absolute record was Craig Breedlove's Spirit of America. Since then, no wheel-driven car has held the absolute record. There is no "wheel-driven" category as such. The Fédération Internationale de l'Automobile validates records in a variety of classes, of which the "wheel-driven" classes are in Category A (Special cars) and Category B (Production cars). The accepted record is fastest average speed recorded over one mile or one kilometer with a flying start, averaged over two runs in opposite directions within one hour of each other. The most recent Wheel-driven" record holders have been from a variety of different classes within Category A.
July 17, 1964 Lake Eyre, Australia Donald Campbell Bluebird CN7 Turboshaft — 403.10 644.96 FIA's official absolute record-holder till a change in the rules in December 1964 made jetcars eligible. ^ Fadini, Ugo (20 August 2002). "Who holds the "wheel-driven" LSR?". http://www.ugofadini.com/lsrwdold.html. Retrieved on 2008-11-09. ^ a b c d Fadini, Ugo (17 August 2002). "Don Vesco becomes undisputed holder of the "wheel-driven" LSR". http://www.ugofadini.com/lsrwdnew.html. Retrieved on 2008-11-09. ^ "from our motoring correspondent" (Saturday, Dec 12, 1964). "Land Speed Record Agreement". The Times (Issue 56193): p. 7, col E.
^ a b c d e "List of Records Category A" (in French) (PDF). FIA. 2008-06-05. http://argent.fia.com/web/fia-public.nsf/AB19CCBEAE22D41BC125745F00375686/$FILE/Liste%20Records%20Cat%20A.pdf. Retrieved on 2008-11-06. ^ a b c d "Appendix B: Category A". Records. FIA. http://www.fia.com/en-GB/sport/records/appendixb/Pages/CategoryA.aspx. Retrieved on 2008-11-09.